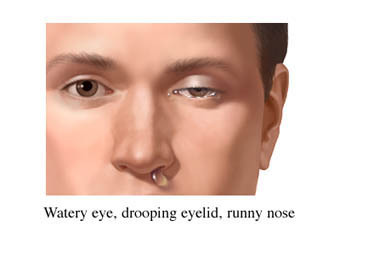 Cluster headache is a type of severe, recurring pain that is located on one side of the head. It received its name from the clustering, or pattern, of frequent headaches that usually occur. Episodic—These occur one or more times daily for multiple weeks. The headaches then go away and come back months or years later. Chronic—These occur almost daily with headache-free periods lasting less than a month. Either type of headache may switch to the other type. The cause of cluster headaches is not known. It is thought that there is abnormal activation of the area of the brain that is responsible for regulating temperature, blood pressure, hormone release, and sleep. The pain is thought to be caused by a combination of widening of the blood vessels and inflammation of the nerves of the face. Causes an aura—This can include visual disturbance, visual spots, or the inability to move one side of the body. Treatment aims to reduce the frequency of headaches and relieving pain. Maintain the same sleep routine. Avoid afternoon naps or sleeping in, which may bring on more headaches. Do not drink alcoholic beverages. Even a small amount of alcohol can trigger a headache during a cluster period. Learn stress management techniques. Stress can bring on a headache. Do not smoke . Tobacco may interfere with medications. Find out what your headache triggers are and take steps to avoid them. Medications used to treat migraines often relieve sudden attacks of cluster headaches. These drugs must be taken at the first sign of a headache. Other medications may also be prescribed. In some cases, the headache does not last long enough for medications to be helpful. Sometimes, the medications just delay an attack, rather than stop an attack. Painkillers, especially opioids, may not be effective during an acute attack. Other medications may be given to prevent or reduce the frequency of headaches. Breathing 100% oxygen for 10-15 minutes often relieves cluster headache pain. This is often viewed as the first-line therapy for cluster headache. The oxygen appears to decrease blood flow to the affected area of the brain. People under age 50 who have episodic cluster headaches seem to benefit most from oxygen therapy. Oxygen therapy can be expensive. There are also risks with this therapy. As a last resort, some doctors may recommend cutting or destroying a facial nerve to eliminate pain. Maintain a regular sleep routine . Talk to your doctor about how to quit smoking . Avoid alcohol, opioid pain relievers, bright sunlight, and emotional stress. Get moderate physical exercise . Beck E, Sieber WJ, Trejo R. Management of cluster headache. Am Fam Physician. 2005;71(4):717-724. Cittadini E, May A, Straube A, et al. Effectiveness of intranasal zolmitriptan in acute cluster headache. Arch Neurol. 2006;63(11):1537-1542. Cluster headache. EBSCO DynaMed Plus website. Available at: http://www.dynamed.com/topics/dmp~AN~T116292/Cluster-headache . Updated February 16, 2016. Accessed November 10, 2017. Finocchi C, Del Sette M, Angeli S, Rizzi D, Gandolfo C. Cluster headache and right-to-left shunt on contrast transcranial Doppler: a case-control study. Neurology. 2004;63(7):1309-1310. Leone M, Bussone G. Pathophysiology of autonomic trigeminal neuralgias. Lancet Neurol. 2009;8(8):755-764. Leroux E, Valade D, Taifas I, et al. Suboccipital steroid injections for transitional treatment of patients with more than two cluster headache attacks per day: a randomised, double-blind, placebo-controlled trial. Lancet Neurol. 2011;10(10):891-897. May A, Leone M, Afra J, et al. EFNS guidelines on the treatment of cluster headache and other trigeminal-autonomic cephalgias. Eur J Neurol. 2006;13(10):1066-1077. NINDS headache information page. National Institute of Neurological Disorders and Stroke website. Available at: https://www.ninds.nih.gov/Disorders/All-Disorders/Headache-Information-Page. Accessed November 10, 2017. Obermann M, Holle D, Naegel S, et al. Pharmacotherapy options for cluster headache. Expert Opin Pharmacother. 2015;16(8):1177-1184. Russell MB, Anderson PG, Thomsen LL. Familial occurrence of cluster headache. J Neurol Neurosurg Psychiatry. 1995;58(3):341-343. Van Vliet JA, Bahra A, Martin V, et al. Intranasal sumatriptan in cluster headache: randomized placebo-controlled double-blind study. Neurology. 2003;60(4):630-633. 10/25/2010 DynaMed Plus Systematic Literature Surveillance http://www.dynamed.com/topics/dmp~AN~T116292/Cluster-headache : Francis GJ, Becker WJ, Pringsheim TM. Acute and preventive pharmacologic treatment of cluster headache. Neurology. 2010;75(5):463-473.